Snow (or wintery despair) coming? Ian Black (from CBC Ottawa) usually has the latest and most accurate info re: weather in Ottawa. Here’s Environment Canada’s weather forecast and the official weather warnings. Check out the Franktown radar to track the snow. Follow our Twitter feed @ottawastart for timely updates. Check out what’s happening around the City on Ottawa’s traffic cams You can also view provincial highway cameras on this page. The hashtag #OttWinter on Twitter is a good one to watch. Check out our Toboggan Guide or Ski Guide. Our Ottawa traffic guide has plenty of useful info to help you get where you’re going. The Ottawa Student Transportation Authority website posts info about school bus cancellations. You can get info on West Quebec school buses here. OC Transpo posts route cancellations & delays to their web site. Google Maps has a traffic layer showing how well (or how poorly) traffic is moving. Find out of there’s an overnight parking ban on the city’s website. The city calls one whenever Environment Canada forecasts snowfall of 7 or more centimetres of snow and bans are in effect from 1 a.m. until 7 a.m.
You can see a map of power outages in Ontario via the Hydro One Storm Centre. Find local updates on Hydro Ottawa’s site. If you’re flying somewhere or expecting visitors from out of town, here’s the link to flight information at the Ottawa Airport. You can check for VIA Rail delays here. Want to know when the plow is coming? Need to report a pothole? Wondering about who’s responsible for cleaning snow off your road or sidewalk? 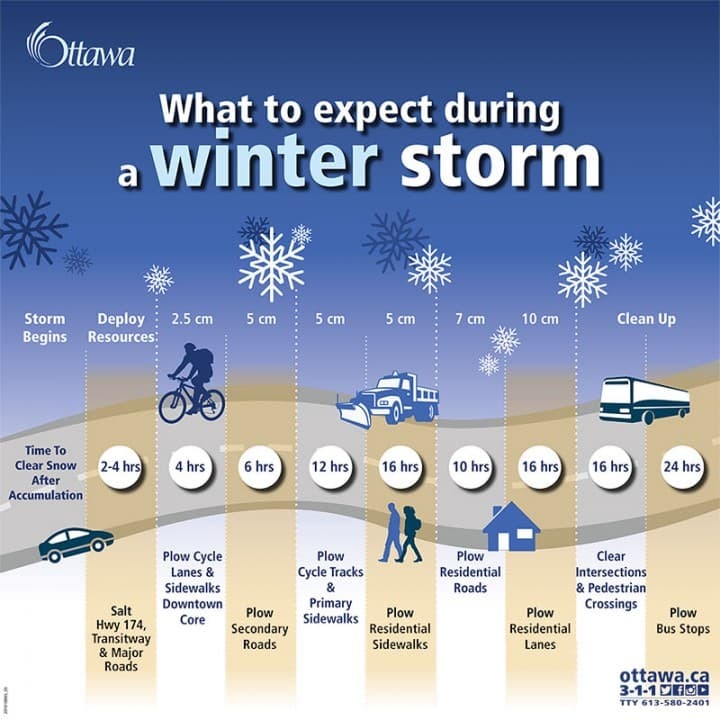 Check out this page about the City of Ottawa’s winter road maintenance.